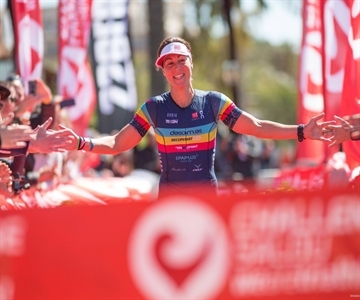 With an impressive winning time of 04:16:58 Judith Corachán has defended her title at CHALLENGE SALOU 2019. The Catalan triathlete was able to dissociate runner up Daniela Bleymehl (04:18:38) and third place finisher Emma Pallent (04:20:04) on the run course. In the male’s category, Belgian triathlete Pieter Heemeryck came out on top with a time of 03:46:40. "It was crucial for me to break away on the bike together with Antony Costes. Going into the run i felt really good and was able to keep my lead. I am absolutely happy with my first victory of the season and already looking forward to my next race at CHALLENG EMOGAN GRAN CANARIA", said Heemeryck. Two minutes later, Pablo Dapena (03:48:02) crossed the finish line and repeated his second place from last years edition. The young British Thomas Davis, with a time of 03:49:19, completed the men’s podium. In the SHORT category Adrián Muñoz (02:45:58) finished the race in first place of the men´s field, followed by Martin Iraizoz (02:50:32) and Adrián Ivars (02:54:11). French triathlete Marjolaine Pierre won in the females SHORT category in a time of 03:09:18. Second and third places have been for the Spanish athletes Isabel Gómez (03:14:17) and Ana Martinez (03:28:13), respectively. Beyond the Sunday mid-distance triathlon, CHALLENGE SALOU presented “The Festival”, an offer of activities so that families could also merge family and sport during the whole weekend. Whereas a “Meet & Greet” with some of the best professional athletes was held on Friday, activities such as the "Breakfast Run", the "Junior Challenge", the "Challenge Women", the "Pasta Party" and the PRO Briefing were organized on Saturday in a fantastic and friendly environment. After closing registrations on February 22, Challenge Salou consolidated its international prestige with a spectacular team of 1050 triathletes from 40 countries and 78 professional triathletes who took part in the PRO start list. CHALLENGE SALOU is the main international triathlon event of the Costa Daurada area, in Catalonia, Spain, with more than 1,500 participants and 7 different races. From the 5th to the 7th of April 2019, CHALLENGESALOU offers the opportunity to swim on a beach with shallow waters and views that reach the Delta de l'Ebre and Serra de la Mussara, to get an amazing average speed on the cycling course and to enjoy the run along the charming Costa Daurada and the fantastic warmth of its audience. In addition to the Half, Half Relay and Short races, different activities turn the weekend in Salou into a real party for the whole family. Based in Amberg, Germany, CHALLENGE FAMILY is the leading global triathlon festival race series. With over 40 races annually across 26 host countries, CHALLENGE FAMILY is the fastest growing mass endurance triathlon brand in the world. CHALLENGEFAMILY offers “events for everyone” with a “festival character,” so that everyone can share in the triathlon experience, from professionals to age-groupers.